Us Ruby girls LOVE Instagram. It's the place to be these days in social media, and not only individuals like us, but businesses and websites all around the world have their own Instagram accounts. In December we introduced a new fun feature on the blog showcasing our Instagrammer of the Month, and this month, our instagrammer is in the wedding industry. 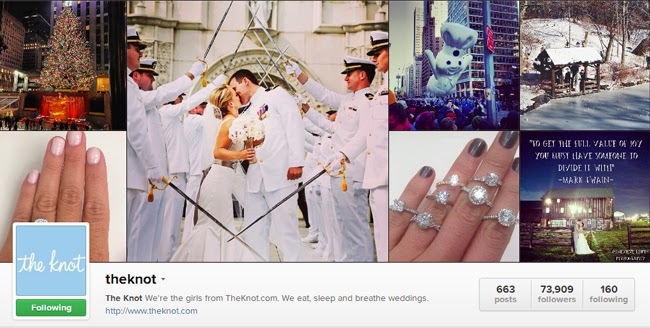 We know that lots of people got engaged over the festive season, and if you're looking for some daily wedding inspiration, The Knot is a great account to follow. They are huge in wedding circles, and host an amazing wedding website that helps brides plan their big day from A to Z. The ladies from The Knot go to lots of bridal fairs by top designers, get sent lots of exciting things from wedding vendors, and have their own amazing magazine. Find them here on Instagram.